This book is aimed at new and inexperienced players with small gut-strung harps of about two and half octaves. 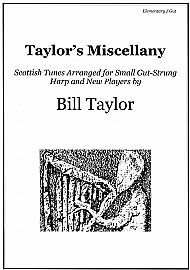 Fingerings, placement brackets and ornamentation are given in this progressive introduction to Scottish music on the harp. Airs, lullabies, marches, jigs, and reels, from a variety of sources, are included along with recent compositions. Recordings of the pieces by Bill are available here as mp3 audio files. These are intended as learning aids.